"The day dawned forth resplendent in its glory, And all things were answered in heaven and on earth." 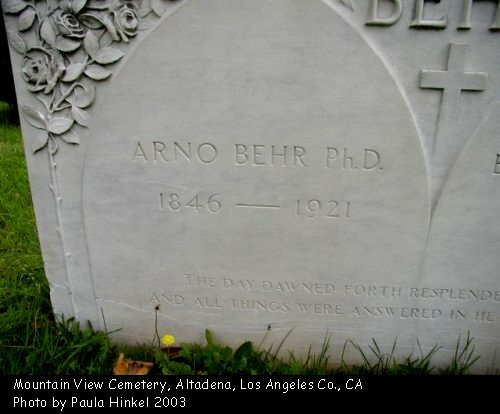 Eve M. Behr, wife of the late Arno Behr, chemist, was buried in Mountain View Cemetery, Pasadena, yesterday afternoon. The sweet simplicty of the services over which Rev. Albert Hall, pastor of St. Mark's Episcopal Church, presided, was accentuated by the playing of "On Wings of Song" (Mendelssohn) by Gertrude Cohen, concert pianist of Los Angeles, who was a lifelong friend of Mrs. Behr. 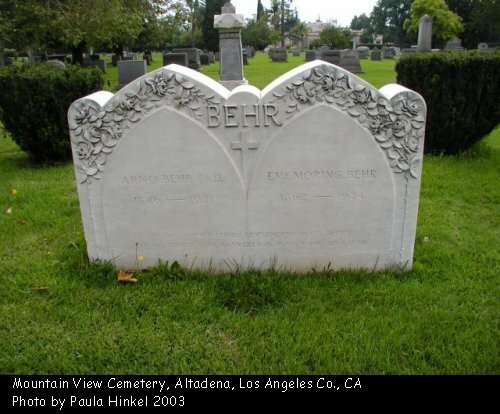 Mrs. Behr had been a resident of Pasadena for twenty-five years and had many friends in the community. The casket was borne by her sons, Ernest E. Behr and Otho M. Behr, her sons-in-laws, Rufus F. Spalding and John S. Daggett; her grandson, Rufus P. Spalding, Jr., and Jim Spalding. The funeral services were conducted at the Behr home on South Grand Avenue, South Pasadena, at 2 o'clock. The many beautiful floral pieces and concourse of friends bespoke the friendship and love of old acquaintances who do not forget. Dr. Arno Behr, internationally known for his inventions in connection with the starch and glucose industries of America; winner of the Perkins research medal Jan. 22, 1909 "for distinguished service to applied chemistry," resident of Southern California for twenty-five years, passed away yesterday morning in his 75th year at his residence, 225 Grand Avenue, South Pasadena. Dr. Behr was born in Polompen, Germany, August 14, 1846, and became a naturalized citizen of the United States in 1881. He was graduated from three universities in Germany, Tubingen 1866, Berlin 1867, and received his Ph.D. degree from Heidelberg in 1869. He came to America in 1874, identifying himself with Matthiessen and Wiechers Sugar Refining Company, Jersey City, NJ, for seven years and was superintendent of the Chicago Sugar Refining Company for eleven years. From the refuse of the manufacture of starch and glucose from corn and many by-products, he finally invented anhydrous sugar as a corn product, an achievement which chemists of the world had declared to be chemically impossible. Dr. Behr was known as a scholar, keenly posted on affairs of the world and at all times as a man of gracious temperment. 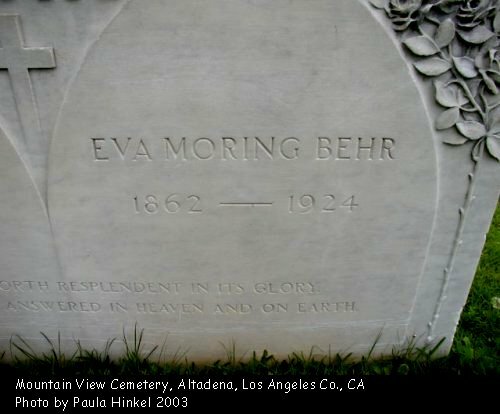 He leaves a widow, Eva Moring Behr; two sons, Ernst E. Behr, Otho M. Behr, and a daughter, Mrs. Rufus P. Spalding of Pasadena. Arrangements for the funeral await the arrival of Ernst Behr, who was in Salt Lake at the time of his father's death.